A Digimon characterized by its perturbing, flashy colors. 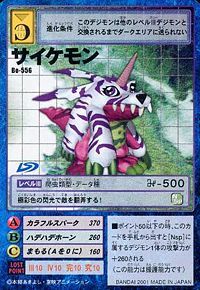 It is said to be a variant of Gabumon. 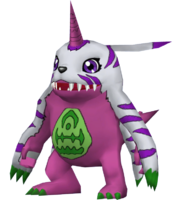 Although it has a personality that is as bright and showy as the colors on its body, it apparently turns cowardly when its fur pelt is removed, just like Gabumon. Its Special Moves are concentrating colorful electrical energy in primary colors, and causing it to explode in range of the enemy (Colorful Spark), and accumulating that same colorful electrical energy in its horn and releasing it (Hadehade Horn). Also, its "Genshoku no Mai", which utilizes the primary colors on its body to perform a peculiar dance, bewildering the enemy, is not something to be taken lightly. 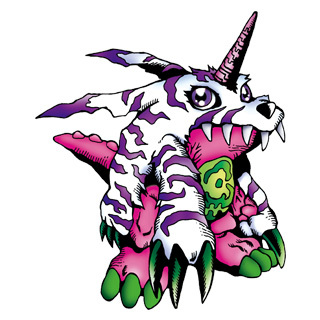 A Digimon characterized by its perturbing, flashy colors. Although it has a personality that is as bright and showy as the colors on its body, it turns cowardly when its fur pelt is removed!? 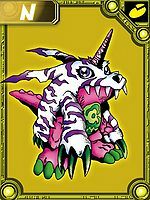 Its Special Moves are concentrating colorful electrical energy in primary colors, and causing it to explode in range of the enemy (Colorful Spark), and accumulating colorful electrical energy in its horn and releasing it (Hadehade Horn). 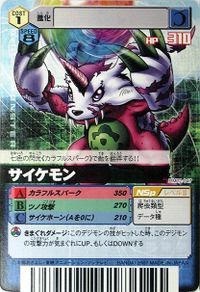 By Super-evolving, it becomes Astamon. n., From psychedelic 「サイケデリック Saikederikku」. 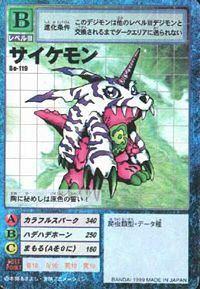 カラフルスパーク Karafuru Supāku Colored Spark/Colored Sparkle Releases colorful electric shocks from its horn, mouth, or pelt. Slashes with its horn engulfed in colorful flames. 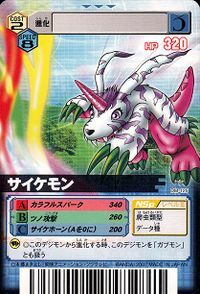 Hade Hade Horn  Flashy Horn ハデハデホーン Hadehade Hōn Striped Horn Attack/Glittering Horn Jumps horn-first with sparkling lights at the enemy. Genshoku no Mai  Dance of Primary Colors 原色の舞 N/A Colorful Dance Does a dance to release a wall of blocks in the color of primary colors at the enemy. Glows with a colorful aura and jumps at an enemy, stabbing through them with its horn. Emits a small blast from the mouth. 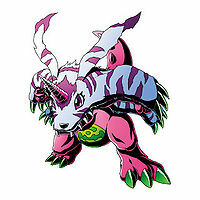 Psychemon in Digimon Xros Wars. 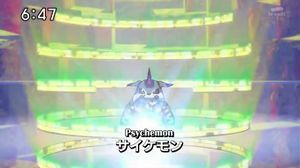 Psychemon is the partner of Mogami Ryouma. 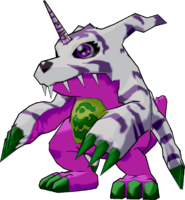 Psychemon is an unavailable Digimon normally in the game, but can be obtained by using a cheating device. 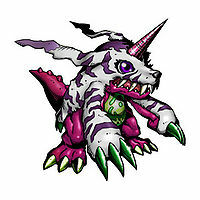 It does not evolve into any Digimon. 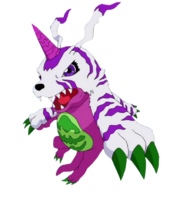 Psychemon is an obtainable evolution of Lalamon. 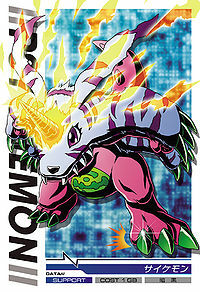 Psychemon is available as a Digimon Medal. It keeps its true colors to itself! It confuses enemies with its multicoloured flashes! 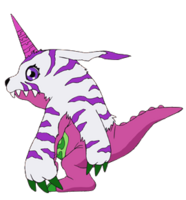 A variant of Gabumon who wears a flashily colored fur pelt. 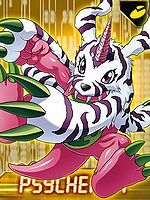 Although it has a bright, showy personality, it becomes cowardly when its fur pelt is removed, similarly to Gabumon. Both its horn and Special Moves are as colorful as its appearance. 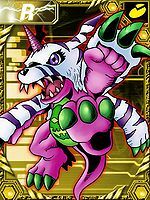 ↑ Digimon Xros Wars: "Okonomiyaki Panic! The Town Full of Pagumon"
This page was last modified on 18 November 2018, at 18:13.